Are You Eligible To Claim Self-Education Expenses? The value of a good education is widely accepted, and over the course of your working life, you may commonly find that further learning is required along the path of your chosen career. Changing technology and evolving workplaces mean that at some stage in every taxpayer’s life, an educational re-boot could become necessary — as the adage says, “you’re never too old to learn”. Therefore, supplementary education mid-career is a valuable, and hopefully, income-boosting, pursuit. Funding for your ongoing professional education, however, is another consideration, although this is generally also seen to be worthwhile pursuing — to use another quote, “if you think education is expensive, try ignorance”. Fortunately, Australia’s tax system is set up to provide some breaks to help the motivated among us get ahead. 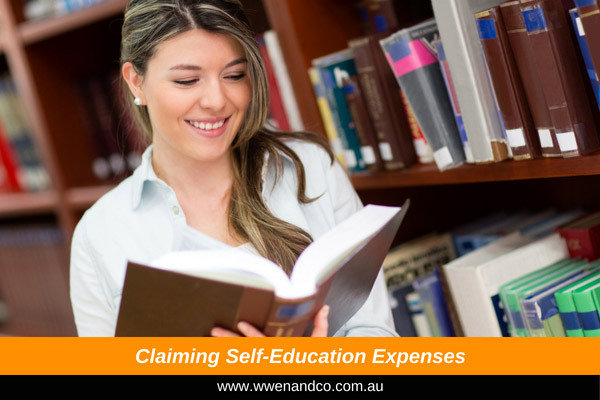 To be able to claim certain expenses relating to self-education is a tax concession not to be overlooked. But to be eligible, your present employment and the course you undertake must have sufficient connection for the self-education expenses to qualify as a work-related tax deduction. In other words, if the course of study is deemed to be too general in nature, and can be viewed as having little relevance to your income-earning activities, the connection between them (and eligibility for a tax deduction) may not be seen to be viable by the ATO. Deductions are also not generally available if the subject of self-education is designed to obtain new employment or to open up a new income-earning activity. You are upgrading your qualifications for your current employment – for example, upgrading from a Bachelor qualification to a Masters. You are improving specific skills or knowledge used in your current employment – for example, a course that will allow you to operate more or different machinery at your current job. If, however, you travel from home to an educational institution and then to your place of work and return home by the same route, only the costs of the first leg of each journey are allowable, as being incidental costs of the study. Where you are away from home overnight in connection with a self-education activity, accommodation and meal expenses incurred are generally deductible. Examples include an overseas study tour or sabbatical, a work-related conference or seminar or attending an educational institution. These expenses are part of the unavoidable cost of undertaking the tour or attending the conference or seminar or going to the educational institution. The ATO does not deem this expenditure as being of a private nature because its “occasion”, as it puts it, is the travelling away from home to pursue activities to enhance income-producing abilities. In regard to the general rule outlined above, however, the ATO has in the past referred to a court case outcome that supports its view that there may be exceptions to deny travel deductions, for example where a taxpayer establishes a new home while incurring educational expenses. If you have a room set aside for self-education purposes, you may be able to claim a decline in value of (and repairs to) the home office furniture and fittings, as well as a portion of the heating, cooling, lighting and cleaning representing the period the room is used for self-education activities. Alternatively, there is available a fixed rate of 45c per hour of usage instead of keeping individual costs for heating, cooling, lighting, cleaning and decline in value of furniture for that room. Occupancy expenses, however, are disallowed. Expenditure on meals while attending an educational institution, work-related conference or seminar where the taxpayer is not required to sleep away from home. If you have questions about your self-education expense claims, please contact the accountants at our Epping office.